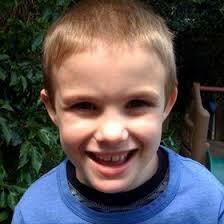 7 year old Owen Black has been missing since Friday afternoon at about 5 pm, May 17, 2013 in Escambia County, FL. Owen Black is autistic and was last seen in the area of the Needle Rush Point condominiums in the 17100 block of Perdido Key Drive. This number, 850-207-5498, has been established for groups wanting to help with the search effort to call. The Escambia Search and Rescue has set up a mobile command center in the back parking lot of the Happy Harbor, 29601 Perdido Beach Boulevard in Orange Beach. Search updated can be seen at Facebook OfficialECSO. Owen Black, who is autistic, was last seen Friday in the area of the Need Rush Point condominiums in the 17100 block of Perdido Key Drive. Owen was wearing a blue striped shirt and brown sweatpants. He is about 4 feet tall and weighs about 45 pounds. Owen has short blondish brown hair and brown eyes. UPDATE I: 8 yr-old autistic boy goes missing on Florida vacation. Escambia County Sheriff’s officials said Owen Elliot Black was on the beaches of Perdido Key with his mother and wandered off on his own around 4 p.m. Friday. He has brown hair and eyes and was last seen wearing a red and blue striped shirt and brown sweatpants. Deputies and K-9 dogs trampled over sand dunes and searched in bushes, hoping Owen may be hiding because he was separated from his mother and was taught to avoid strangers. UPDATE II: Search planned for Sunday, May 19. All individuals wishing to assist in the search on Sunday can report to the back parking lot of Happy Harbor at 29601 Perdido Beach Boulevard in Orange Beach, Alabama. The number to the mobile command center is (850) 207-5498 should you or your group wish to assist with the search efforts. Anyone with information on Owen’s whereabouts can call 850-436-9620. UPDATE III: Missing autistic boy found dead in water off Perdido Key. Rest in Peace Little Guy. Thank you “Searching” for the update. An 8-year-old boy missing since Friday on Perdido Key has been found dead in the water, authorities on the scene confirm. A crime scene has been set up on the beach behind Shipwatch Surf & Yacht Club on Perdido Key Drive (MAP). UPDATE IV: Escambia County Sheriff’s Office. At approximately 1303 CST our search for Owen Black is concluded. A citizen in Perdido Key observed him in the water washing toward shore. An immediate response has determined that he succumbed to drowning. There are no indications of foul play; however the standard investigative and medical examiners protocols will apply.